In this park, sand dunes of up to 750 feet―the tallest in North America―are dwarfed by the 13,000-foot peaks of the Sangre de Cristo Mountains. During May runoff, Medano Creek becomes a virtual water park, with gentle, kid-friendly flows. $14 (plus $3 park entrance fee for adults 16 and up); no reservations; 719/378-6300. 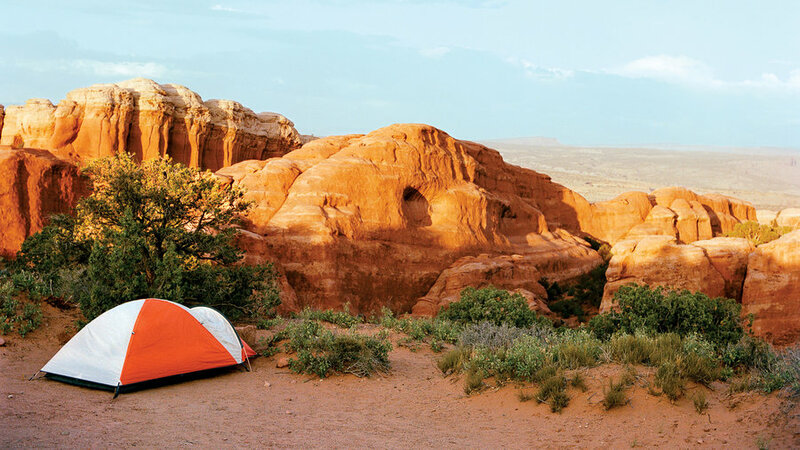 From your campsite, spot steep-walled canyons and crimson-colored rocks of the national monument. Hike the 6-mile Monument Canyon Trail to see signature rock formations. $10 (plus $7 park entrance fee per vehicle); no reservations; 970/858-3617 ext. 360. Talk about prime real estate: These 19 tent-only sites sit right on the edge of Turquoise Lake, so you wake to views of soaring Sugarloaf Mountain framed by broad blue waters. String a hammock among the lodgepole pines shading the shoreline, take a bracing dip in the lake, or cast a line for trout. $20; May 22–Sep 7; vault toilets; no reservations; . It’s big (80 sites), so you’ll almost always find a vacancy—and privacy. Sites sit among piñon pines and junipers, which create the illusion of solitude. And because they overlook the canyon rim, sites here enjoy cooler temperatures and easy access to commanding views: The campground’s Window Rock and Canyon Rim Trails lead to stunning vistas of red rock spires. $20; $10/vehicle; open year-round; . The nine vintage trailers at this throwback campground in Cañon City are now equipped with WiFi, a pool, and dog park. Sleep under the stars in one of two new teepee sites on this privately owned organic homestead in Alpine. Pets are welcome. Lost Lake is a gorgeous gateway to Kebler Pass, one of the country’s largest aspen groves, near Beckwith Mountains. Take the 3-mile Three Lakes Loop from the campground and pass countless aspens painting the hills yellow. $20/night; Mid-June–Oct; No reservations; . Stretching northeast for some 10 miles from near the west entrance to Montana’s Glacier National Park, Lake McDonald has a beauty that seems easy, almost lazy, with dense forest sloping down to the glass-smooth water. Lake McDonald is the largest (10 miles long) and deepest (464 feet) body of water in the park. Campsites sit in a pine forest beside glacier-fed Lake McDonald, with Continental Divide peaks at the head of the lake. The famously precipitous Going-to-the-Sun Road over Logan Pass isn’t open to cars until June (and free public bus tours start July 1), but a portion opens to bikes and pedestrians in May. $20 (plus $25 park entrance fee per vehicle); no reservations; 406/888-7800. The quiet, rarely crowded campground sits by a tree-encircled lake with gorgeous mountain views, 40 miles from the Canadian border. Visit nearby Polebridge Mercantile (406/888-5105) to meet locals and try homemade huckleberry macaroons. $15 (plus $25 park entrance fee per vehicle); no reservations; 406/888-7800. Montana’s is a complete planner’s paradise. The 37,000-acre ranch offers customizable family reunion packages, modeled after your needs. Choose from rustic homes year-round; in May through October, connect with nature in luxury safari-style tents. Ride off into the sunset on horseback. For a ride with more cushion, plan to hop in the carriage for a lazy Chuck Wagon ride under Montana’s big, open sky. The horse-drawn affair drops your group off at the rushing banks of the Blackfoot River for a cozy meal and a complimentary glass of sangria for the 21-and-older members of your family. The Greenough resort with 30 luxury tents and 28 cabins kicks off the summer with a campfire concert series. Each of the 18 new sites in Placid Lake and Salmon Lake State Parks attract camping cyclists riding site to site. Ammenties include a fire ring, potable water, and covered shelter with picnic tables. Between Arches and Canyonlands national parks, Dead Horse Point deserves to be a national park itself. Anywhere else it would be. The point is at nearly 6,000 feet and towers 2,000 feet above a gooseneck bend in the Colorado River. The Colorado flows more gently just south of Arches National Park, making this area perfect for low-key kayaking or float trips. Campsites string out along State 128, with cliffs on all sides. At Hal Canyon Campground, nab site 2 or 11 for secluded riverfront. $12; no reservations; 435/259-2100. Virtually unobstructed views of red rock country are the reward for camping above the Little Grand Canyon. Follow informal trails along the canyon rim for your own sunset lightshow. BYO water. Free; no reservations; 435/636-3600. New Conestoga wagons in Capitol Reef National Park are modeled after authentic 18th-century designs and feature a king bed. Private bathrooms and fire pits are just a few steps away. In Wyoming’s Grand Teton National Park, Jenny Lake reflects the Teton peaks better than any mirror. And Jenny Lake Lodge reflects rustic elegance. The restored historic cabins have handmade quilts. Breakfast, five-course dinner, and use of bikes and horses are included. From $500; . Jenny Lake is undoubtedly one of the most beautiful lakes in the world. The 49 sites aren’t directly on the water—instead you camp among pines and grab views of the Tetons, then walk a few yards to see the astonishingly beautiful lake. The campground is near the visitor center, with great trail access. In summer, get here by 7 to nab a spot. $23; $25/vehicle park entry; open May 9–Sep 27; no reservations; . The Cottonwood campground at Keyhole State Park gets an upgrade in the form of a private tree house with three rooms, an electric fireplace, and a large deck overlooking the lake.